Paul Schubert Painting Inc. knows that a professional paint job can make a world of difference. When you think of your location as a blank canvas, the experts at Paul Schubert Painting Inc. can help you select a unique palette that reflects your personality. Serving San Diego County since 1978, we are a company that takes pride in our quality craftsmanship by offering prompt and reliable services. Are you tired of looking at beige walls? Is your exterior paint beginning to crack, peel, fade or look really outdated? Do you want an updated professional look for your business? Our goal is to help protect your property investment by keeping it beautiful. We are experts in all aspects of painting. At Paul Schubert Painting Inc., we are fully qualified to handle any project. From residential interior and exterior jobs to commercial and industrial properties, there is no job too large or too small. We make sure to take care of your investment by doing the work right the first time, and making your property look more beautiful than it did before. 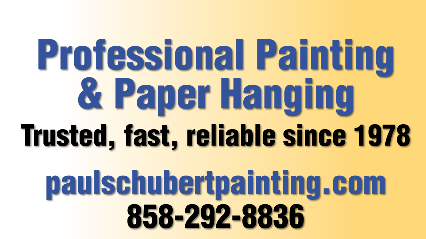 When you need a high-quality, precise paint job, call Paul Schubert Painting Inc. We offer excellent services at unbeatable rates. Take a moment to look at our gallery of work to see what we can do for you.